Rice Lake Glass & Door., Co Inc. was founded in 1948 by Donald and Roy Curnow. After 25 years of glass business, Jerry Curnow purchased the company in 1973, and was then purchased by third generation business owner Nels Curnow in 2003. As a commercial glass contractor, we have always and continues to focus on serving customers with unique commercial and special residential glass projects. Our work typically takes place in Northern Wisconsin, Northern Michigan, and Eastern Minnesota including the Twin Cities metro area. In addition to the work we’ve done in the midwest, we’ve been happy to serve customers across the country from Wisconsin to California. In 2017, we moved into a brand new building to help better serve our customers! 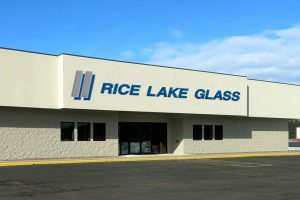 Who We Work With Rice Lake Glass will work with any type of customer! We serve the commercial, healthcare, education, public works, and residential industries with glass installation and window repair and replacement often. Whether it is a general contractor, architect, designer, owner, and/or artist, we will meet with the leader of your team to achieve the goals of your project. We help any customers to create an efficient environment using natural light and well constructed entrances in ways that complement projects. Technology Although our commercial glass homebase is located in a small town, we utilize the newest technology to get your job done. Rice Lake Glass utilizes THOM produced by ERGO Robotic Solutions for manipulating heavy glass units in challenging situations that would otherwise be nearly impossible. The Telescopic Handler Outdoor Manipulator is a fork-attached adapter that can turn any telescopic handler into a remote-controlled multi-axis glass manipulator. THOM helps Rice Lake Glass by lifting 2,000 pounds of windows and doors safely, reducing the risk of work-related injuries to our employees and lets us perform the same tasks with fewer crew members. Yes! We offer our customers emergency service for glass window repair and window replacement upon request as well as commercial door repair and replacement. Our fleet of service vehicles is fully stocked with common parts and our experienced staff is ready to respond to your window issue and get you back on track. Do you help with restoration projects? We do! We have experience working with properties on the National Register of Historic Places and National Parks to provide glass and door repair and window replacement to improve efficiency, repair outdated or unsafe window and door problems, and to restore the property carefully and accurately. What is the THOM Glass Manipulator? The THOM (Telescopic Handler Outdoor Manipulator), produced by ERGO Robotic Solutions, is a fork-attached adapter that can turn any telescopic handler into a remote-controlled multi-axis glass manipulator. Rice Lake Glass & Door utilizes the ERGO Robot for manipulating heavy glass units in challenging situations that would otherwise be nearly impossible. This ERGO Robot is the only one in the Midwest, and is available for hire with a trained operator. It is especially useful for challenging terrain of job sites. Rice Lake Glass is proud to use glass window and door products from Ceco Door, Raynor, Ideal Door, Liftmaster Profesisonal, Tubelite, and Wausau. Will you perform work outside of "normal" business hours? Service and installation for commercial glass projects may be scheduled outside of business hours during evenings or weekends per customer request. Call for available dates and times. Rice Lake Glass is MSHA Certified and AAADM (American Association of Automatic Door Manufacturers) Certified.